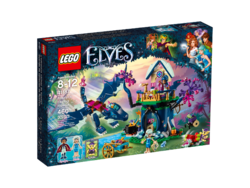 41187 Rosalyn's Healing Hideout is an Elves set released in 2017. 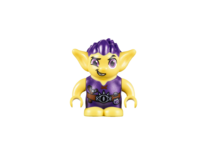 Heal the baby dragon and transform a goblin from bad to good! Join exciting adventures in Elvendale as Rosalyn Nightshade the healer elf aids the elves in their quest and guards the forest with Sapphire the dragon, featuring translucent wings, space for 2 mini-doll figures and the baby dragon on her back, plus an unfolding tree that reveals a hidden 2-level treehouse with an alchemy room and medical workstation. Includes 2 mini-doll figures, plus a goblin and 3 animal figures. 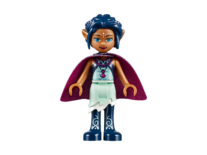 Includes 2 mini-doll figures: Rosalyn Nightshade and Naida Riverheart, plus Rimlin the Goblin, Sapphire the dragon, Lula the baby dragon and Lil’ Blu the baby bear figures. Features a tree with unfolding branches that reveal a 2-level treehouse with an alchemy room, fireplace, moving leaves, kitchen, bedroom and a medical workstation, plus a big cart. Also includes a posable adult dragon with translucent wings and room for 2 mini-doll figures and the baby dragon figure on her back, plus a small carnivorous plant area with closing plant trap. Open the outer branches of the tree and reveal the Healing Hideout’s second level. Load the cart and carry potion ingredients and bottles to the cauldron outside. Push the lever on the carnivorous plant to try and trap the baby dragon. Accessory elements include a potion bottle, cauldron, torch, bow and arrow, wheelbarrow, 2 cookies and a golden crown. Dragon with wings extended measures over 1” (5cm) high, 7” (20cm) long and 9” (23cm) wide. Healing hideout measures over 6” (16cm) high, 3” (9cm) wide and 6” (16cm) deep. Facts about "41187 Rosalyn's Healing Hideout"